Several listeners of the www.chvrchespodcast.com have said they have audio playback issues with some of the podcasts. After several weeks of testing, I was able to get the weird sound issue to happen on my Apple iPod Touch. If any of these MP3s don't sound right [Original or Export #1, #2, #3] on your computer or iDevice, then can you please let me know at: sholden@pobox.com. Thanks! Update #1 (9/30/2016 11:15 AM PT) - My friend Victor was not able to find any sound quality playback issues on his iPhone 7 or iPad Pro. Neither could play the WAV file but that is expected. The WAV file sounded fine on his Mac. Update #2 (9/30/2016 11:15 AM PT) - These MP3s all sound AOK to me on my iPad Air 2 in the Chrome browser. Update #3 (10/2/2016 1:45 PM PT) - The first original MP3 and Export #2 and Export #3 make no sound on my iPod Touch running iOS 10 using Safari browser. Export #1 sounds like high-pitched clicks and beeps. Update #4 (10/14/2016 - 9:11 AM PT) - These seem to play find on multiple Android devices, Windows PCs, Macs, Chromebooks, and Linux Desktop OS via multiple browsers. I verified the podcasts play via iTunes also on various platforms other than iPhone 6 devices. This is not meant to be a definitive list, but just a list of possible software solutions for podcasters to consider when they want to record a Microsoft Skype call. These have been mention to me in the past by a podcaster who at the time said they worked for them. Personally I've only used Audio Hijack Pro and then I do all my editing in Audacity (Mac, Windows, Linux). There is a new version of Audacity v1.3.7 (beta) and I've loaded it up on my Mac Book Pro. I used it to mix down the Jersey Boys Podcast #66 without any issues. I've been using the previous version - v1.3.6 (beta) - without any major problems, and I consider this release to be production quality. Another Audacity related item of potential interest, is that the audio for my presentation at the New Media Expo 2007 has been posted to the Podcast Academy site. Here is a link to the PDF slides and a screencast QuickTime movie of the slides. You might have a pretty good online training experience listening to the audio from the Podcast Academy site and watching the QuickTime Movie at the same time. I will be presenting at the New Media Expo 2008 (August 14-16, 2008) a "Getting Started With Audio Editing" session using Audacity from 2:00-3:00 p.m. in room N245 on August 14, 2008. I have created a set of WAV files that will make up my examples and demos that folks who are attending might want to download if they plan to try to follow along during the presentation. The link is here (34-MBs .zip file). I also have posted a copy of my Audacity 101 DAU eLearning 2008 workshop slides in PDF format, and a link to a Blip.TV movie that includes the screencasts that are embedded in the presentation. Unfortunately the movie is not sync'd with audio so you have to work your way through them without narration. NOTE: I will be doing my demos at PME 2008 using the Audacity v1.3.5 (beta) release. There was a question the other day on the New Media Expo Pathable Community mailing list about how to record phone conversations via POTS connections. The Telos One comes highly recommended from two very smart audio gurus at IT Conversations: Doug Kaye and Paul Figgiani. 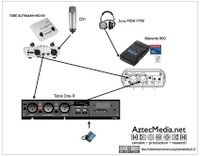 Paul has posted some great resources about the topic over at Podcast Rigs especially this post "Telos One, Talkshoe and Skype." There is also a great podcast with Doug Kaye (MP3) over at Podcast Academy that covers this topic. Both Paul and Victor Cajiao at the Typical Mac User Podcast helped me setup the configuration of my unit - which is done manually with a small screw driver. I also borrowed Paul's unit diagram of a Telos One for my picture. Thanks Paul! I am pretty happy with how this is working now, but I would recommend doing some post production processing on the phone track (usually your guest) with something like SoundSoap. A new version v1.3.4 (beta) of Audacity has been released for Windows and Linux. The latest version for the Macintosh is still v1.3.3 (beta). New Welcome Screen with introduction to Audacity. New 'Mix and Render to New Track' command. Support for VAMP audio analysis plug-ins. More keyboard shortcuts and navigation. New preference: Select all audio in project, if none selected (on by default). New preference: Beep on completion of longer activities. Envelopes: Many fixes when copying, pasting, or repeating. Metadata editor added for OGG, FLAC and WAV/AIFF exports. Muted tracks are no longer audible in the exported mix. I have installed this on two Vista PC systems without any major issues, but I do most of audio production editing on a Mac Book Pro so I have not completely run this new version through the paces.